Learn the Revision Total Hip replacement: Stryker custom acetabulum and SERF Dual mobility Hip (De Puy) surgical technique with step by step instructions on OrthOracle. 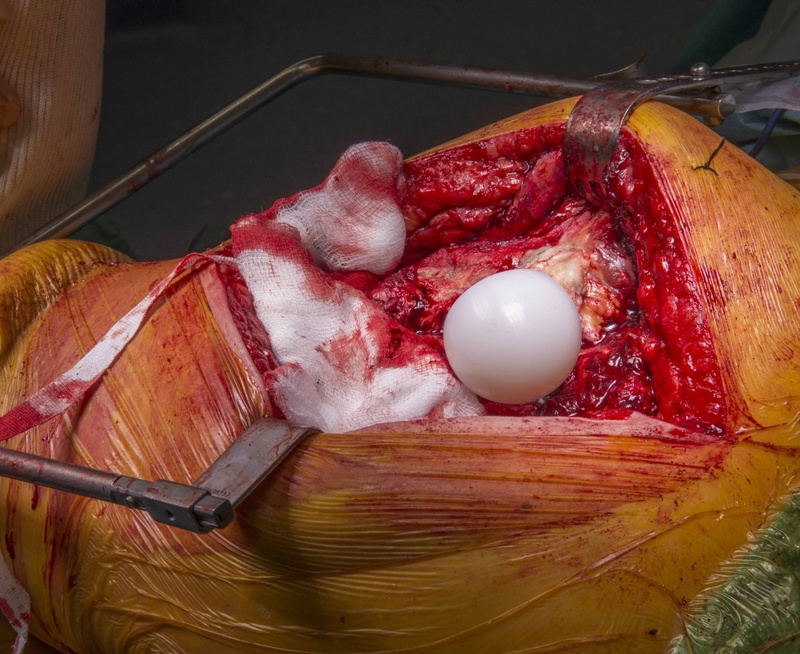 Our e-learning platform contains high resolution images and a certified CME of the Revision Total Hip replacement: Stryker custom acetabulum and SERF Dual mobility Hip (De Puy) surgical procedure. Dual Mobility cups have their origin in France and have been used there with some success for well over 30 years, the first implantations being in 1975 . They have become more popular in the UK over the past decade – their use coinciding with the demise of large diameter Metal on Metal total hip replacements and large diameter Metal on Poly THR. The failure of these bearings was inadvertently caused by inadequate trunnion design which had been altered two decades ago to accommodate the fragility of ceramic heads. Dual Mobility cups effectively permit the use of large diameter bearings by reducing the frictional torque at the head/trunnion junction. Whilst bipolar designs may appear to be similar, they have an inherent mode of failure with the outer shell freely articulating with the native articular cartilage often causing painful wear. In contrast, dual mobility bearings are fixed to the acetabulum either by cement or bone on-growth features. The key feature is that the polyethylene acetabular “liner” articulates (moves) both at its interface with acetabular component as well as with the femoral head. The latter articulation is of course the main source of motion. The standard SERF Dual Mobility acetabulum is a cementless, stainless steel cup with polyethylene insert and is supplied with a femoral head component. In the case demonstrated a custom acetabular component has been initially used to reconstruct deficient bone stock prior to cementation of a cementable cup (an option on the set).